Aaron Craft hit 5 three pointers and had a career high 20 points as The Ohio State Buckeyes basketball team won their season opener 82-60 over the Albany Great Danes this afternoon from the Value City Arena in Columbus. Lenzelle Smith Jr slams home 2 of his 18 points against Albany. Photo courtesy of The Ohio State University. The Buckeyes limited the Great Danes to just 35.6% shooting, including going just 6-22 from behind the arc. Not only did Craft lead Ohio State in scoring, he also did an excellent job of setting up scoring opportunities for his teammates, handing out a game high 7 assists. Pre-season All American selection Deshaun Thomas scored 19 points, and Lenzelle Smith Jr added 18. LaQuinton Ross came off the bench to chip in with 10. Mike Black led Albany with 20 points. 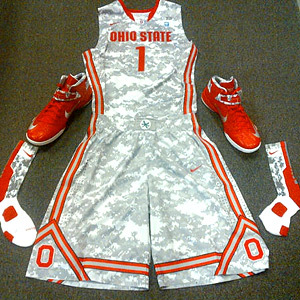 The game was a part of the Basketball Hall of Fame Tip-Off Tournament, and the Buckeyes will continue tournament play in Uncasville, Conn., for their next game, set for Saturday against Rhode Island, of the Atlantic 10 Conference. For highlights of the game click the link below. 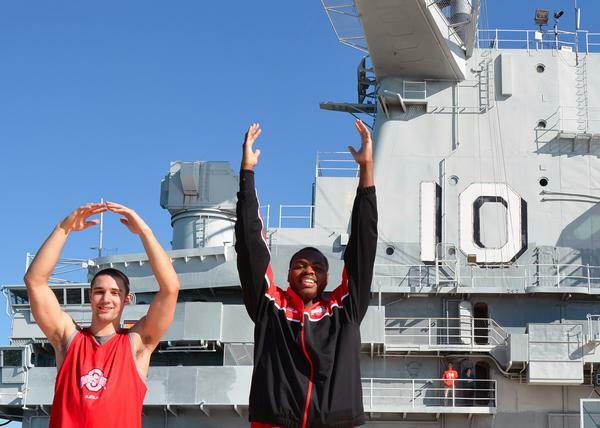 I’m not sure if it’s ironic that a basketball game scheduled to be played aboard a ship was cancelled due to condensation, but that’s exactly what happened to the Buckeyes tonight. Scheduled to take on Marquette as part of the Carrier Classic on the USS Yorktown, officials could not keep water off the playing surface, exposing a dangerous option to the players, so officials of both teams agreed to cancel the contest. Now the Buckeyes opening contest of the season will take place on Sunday in Columbus against Albany. Tip-off is set for 2:00 and the game will be televised by the B10 Network. The Final Four will be in Atlanta this college basketball season and both the Ohio State Buckeyes and Cleveland State Vikings quests begin tonight. Despite the Buckeyes losing two starters, including first round draft choice Jared Sullinger, they return two pre-season All-Amercians in forward Deshaun Thomas (1st team) and point guard Aaron Craft (3rd Team). Tonights game will be played outdoors on the USS Yorktown in Charleston, SC against Marquette. NBC sports channel will televise. The Vikings lost four starters from last seasons NIT tournament squad and this season may be a struggle at times. The constant for the Vikings is the fact that they still have the best coach in the Horizon League in Gary Waters. Tim Kamczyc is the lone returning starter, while sophomore forward Anton Grady is easily the most talented player on the team and is expected to improve on his 8.5 ppg and 6.4 rpg averages this season. The Vikings tip off with Grambling State tonight in the annual John McLendon game.